A CAR has rolled four or five times after being hit by another driver who failed to stop at a stop sign on Quinns Rd. This cane field-lined intersection is notorious for crashes, thankfully this smash didn't result in a grimmer outcome. 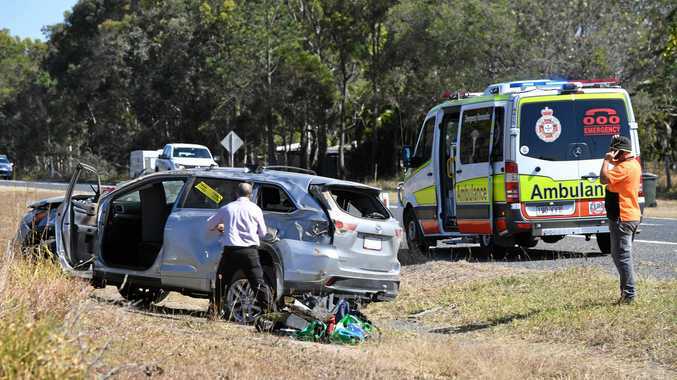 A spokeswoman for the Queensland Ambulance Service Bundaberg said one patient was transported to the Bundaberg Hospital with facial injuries, and the occupant of the other car was uninjured. Senior Constable Carol Wilcox said the male driver was from Brisbane, up in the Bundaberg for work and was looking at his GPS, it wasn't until he was on the junction that he realised it was a stop sign. She said the vehicle, which was hit, was travelling at approximately 100kmh at the time of the collision. "He said he didn't see the Stop sign at all and didn't know there was a main road at the end of it,” Snr Const Carol Wilcox said. "It was only once he was in the intersection that he realised where he was and tried to avoid the car and fortunately clipped the rear end. "If you don't know the road, slow down and pay attention to the road, not the GPS. This crash falls just five days short of the same day a triple fatality occurred at the intersection. On September 10, 2005 three overseas tourists were killed after a mini-bus carrying nine backpackers and a four-wheel drive, with two occupants, collided. Another eight people were seriously injured during the crash in 2005, followed by numerous people since. The crash zone bares three white crosses as a memorial.